Time to raise your APM! Guide by Job "Zoan" Hilbers. You can find him streaming at twitch.tv/captcoach. D.Va is one of the most versatile heroes in the game, with a kit that enables her to both deal damage and support her teammates. By using her kit effectively she can transform from a lean killing machine into your teammates in shining pink armour. Classed as a tank, her priority is to soak damage for her teammates—but find yourselves in close quarters against D.Va and she’ll shred you with her Fusion Cannons. D.Va excels as an off-tank who focuses on briefly shielding from incoming damage, allowing passage onto an objective or guarding against burst damage, harassing targets at short range, and disrupting the enemy. 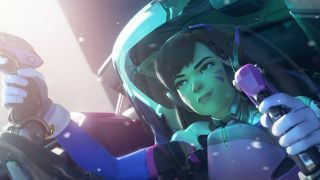 D.Va is weakest against mobile heroes, pincer strategies and non-projectile-based abilities and attacks. Due to the nature of her kit, it’s advised that she isn’t played as the sole tank on a team. The MEKA’s primary weapons are its Fusion Cannons. These are rapid fire shotgun weapons that fire seven rounds per second, with a falloff range of 11-30 meters. Each individual pellet is capable of registering as a headshot. To compensate for D.Va’s infinite clip size—she never needs to reload—her movement is slowed dramatically while firing. This is arguably the hardest primary weapon in the game to utilise properly. With a very short effective range, it takes experience to know when you can try to take on an enemy and when to leave it to the damage dealers on your team. To effectively deal damage with your Fusion Cannons you’ve got to keep in mind that they’re functionally shotguns. Try to focus on targets who are less than 15 meters away from you, and the closer the better. As D.Va’s kit allows her to get close to the enemy whenever she chooses, it shouldn’t be that hard. However, the downside to her Fusion Cannons is the attached movement speed reduction. Enemy players will try to get away from you as fast as they can in order to reduce your damage output. The best way to deal with this is to think of your reduced movement speed as a spray pattern: the longer you hold your left-click, the bigger the chance that you will start missing. You should always try to position yourself close to your target, fire briefly, release, and reposition close to your target again. The Defense Matrix is D.Va’s alternate fire option when in her MEKA, functioning as a temporary shield. When fully charged, D.Va can project her Defense Matrix for up to four seconds and it takes up to 10 seconds to fully recharge. If released early, there’s a one second cooldown before you can project Defense Matrix again. Defense Matrix can nullify any projectile, even piercing ones like Reinhardt’s Fire Strike and Symmetra’s Energy Balls as well as certain projectile ultimates like Zarya’s Graviton Surge right after it’s launched and Hanzo’s Dragon Strike before the initial arrow turns into dragons. However, it won’t protect you against Zarya’s Particle Beam, melee attacks, and certain abilities—like Roadhog’s hook. The matrix is projected as a 15-meter rectangular cone that nullifies all projectile attacks that enter it. In other words: it doesn’t just block projectiles that are coming in from the front, but also projectiles that hit the matrix from the side. As the Defense Matrix is a projected cone you can hold it over either your allies—to protect them from all incoming damage, and thus temporarily making them invulnerable to projectiles—or your enemies, rendering them almost useless by nullifying their damage. This can help a teammate land a game-winning ultimate or prevent the enemy from doing the same. It’s also a great tool to help your team traverse distances safely, particularly when trying to reach a point on Assault and Hybrid maps. D.Va’s Boosters enable her to boost her movement speed both vertically and horizontally (she can fly, in other words.) They’ll only propel you forward, however, so strafing isn’t an option. As the boosters last up to two seconds, the maximum distance D.Va can travel is 25 meters. They also do damage on impact, and can knock back anybody she collides with. They’re best used to get close to enemies so that you can either blow them up with your Fusion Cannons or nullify their damage by laying Defense Matrix over their entire field of vision. Due to the knockback effect, Boosters can also offer some great utility—such as hitting enemies off ledges while they’re defending high ground or trying to flank you. In addition, your Boosters can be used to launch your ultimate, Self-Destruct, at the enemy. Every action movie star loves an explosion and D.Va is no exception. When Self-Destruct is triggered, she ejects herself from her MEKA which explodes three seconds later doing a massive 1000 damage in a 20-meter radius. After the MEKA explodes, she can instantly call down a new one. With only a 1100 point charge required to use Self-Destruct, it falls in the lowest point charge category out of the Tank heroes. However, as D.Va’s only means of doing damage are her Fusion Cannons, it can take a long time to fully charge her ult. It’ll charge passively while she’s out of her MEKA, however. There are three ways to use Self-Destruct effectively. You can use to deliver a huge amount of damage, zone the enemy out of a certain area, or to ensure that you can instantly call down another MEKA when your previous one is destroyed. Self-Destruct itself is loud both visually and audibly and causes a big red exclamation mark to appear on your opponents’ screens—it’s not an ult that can be launched stealthily. Therefore, it’s easier to use Self-Destruct as a zoning tool than it is to get kills with. If you want to get kills, make sure you to use Self-Destruct in an open area where your opponent has fewer cover options. Additionally, try to hide where you can’t be seen and then use your Boosters either vertically or diagonally to launch the Self-Destruct into the air. This makes it harder for your enemies to spot where the ult is coming from and where it’s going to land. However, if your aim is to use Self-Destruct as a zoning tool then you’ll want to make it as obvious as possible. For extra style points, never look at your own ultimate: cool girls don’t look at explosions! When the MEKA is deployed, D.Va ejects and continues fighting without most her abilities. Out of the MEKA, she has 150 health and is only equipped with her Light Gun. Light Gun is a linear projectile weapon that can deliver up to 93 damage per second and is capable of landing headshots. Even though D.Va is strong when she’s inside her MEKA, she still shouldn’t be underestmated when she’s outside of it. The key to surviving and charging up your ultimate in this scenario is positioning. Outside of her armoured battle suit, D.Va is best played as far away from the fight as possible. The Light Gun does not have a damage drop-off point so attempt to hit whoever you can at the longest range possible. Your target priority should be whoever is easiest to hit. In practice this means that you’ll want to focus on stationary targets, however if a mobile hero attempts to engage you then focus fire on them and ask for help—chances are it’s the only way you’ll survive. This allows a MEKA-less D.Va to call down a new one. It spawns with full health and armour and deals 50 damage if an enemy is standing on the spot where it lands, although it takes two seconds for D.Va to summon it. As soon as the MEKA lands D.Va becomes invulnerable, but it can take damage as soon as she starts climbing in. Using Call Mech requires a relatively small charge of 300 points. While calling down a new MEKA, D.Va has to remain stationary and will be vulnerable to enemy attacks. It is therefore possible that you can be killed before the invulnerability kicks in. Therefore, it’s key that you call it down in a safe spot so that you can enter battle in the best possible condition. The only exception to this is when you need to call it down in the thick of battle in order to survive. Due to D.Va’s high mobility, short effective range, and ability to flank she is best played on the offensive side of a map. She is particularly effective on maps where there a lot of high vantage points as she can safely and easily contest them. Such maps include point two on Hanamura, Temple of Anubis, Volskaya Industries, Dorado, and points two and three on Watchpoint: Gibraltar as well as points one and two on Hollywood, King’s Row, Numbani, Illios, and the village section of Nepal. D.Va is a great counter to projectile heroes such as Hanzo, Pharah and Junkrat as well as burst damage dealers such as Reaper and Roadhog as she can easily nullify their damage with Defense Matrix. Be wary of heroes that are very mobile, like Tracer and Genji, as well as heroes who are able to damage you through Defense Matrix such as Mei, Zarya, and Roadhog’s hook. As D.Va you have to be able to effectively switch between guarding your team and flanking the enemy team in order to split them up. Your priority targets for harassment are long range heroes such as Hanzo, Widowmaker and Ana and frontliners like Reinhardt, Roadhog, and Soldier: 76. Always look for opportunities to nullify piercing projectiles and ultimates, even if it means letting your MEKA soak damage for your team. Forfeiting your MEKA is always worth it if it means saving a teammate: after all, D.Va can survive without it. A downside to her passive is that you will often find yourself dying much later than your teammates, however, thus splitting you up for the next battle. If you find that you’re the only one left alive after a fight, look for opportunities to die so that you can set up for the next battle as a full team of six. GL HF!